A practical guide to counter Hate Speech on Twitter. The initiative is launched by Media Diversity Institute in the framework of the project “Get The Trolls Out” aimed at engaging young people around the importance of fighting antisemitic speech and bolstering new media advocacy against hate speech. 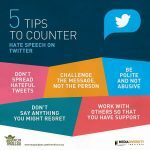 The objective of the guide STOPPING HATE is to counter hate speech as a way of responding to hateful speeches online, providing alternative positive messages, and helping shape tolerance and respect. As a public forum, Twitter is legitimate to require a serious consideration of comments. Hence, they provide a resource bank of ideas and suggestions with a view to adopting the best strategies to follow by using social media. Among the possible solutions and most important recommendations available are: don’t spread their hate, respond promptly, think about your objectives, introduce new hashtags, build a narrative, choose your words carefully, don’t get personal, think about your tone, be visual, disengaging from counter speech. Here you can download the guide Stopping Hate!